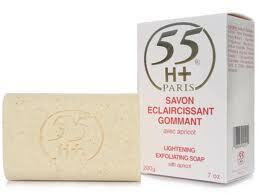 55H+ Lightening Exfoliating Soap Savon Eclaircissant with /Apricot Description: For all skin types. Soap which exfoliates, purifies, lightens and regenerates the skin. Its exfoliating action eliminates dead cells, cleaning and fully purifying the skin, allowing it to renew itself. Result: This soap lightens your skin, leaving it perfumed, smooth and radiant.